Close relationships (e.g., marriage, parent-child relationship) have a major influence on our psychological and physical wellbeing. Our relationships are shaped by us and our partners. Nevertheless, external events out of our control influence our relationship dynamics too. My research examines these different types of influences on relationship wellbeing, focusing on the individual, the partner, and context. In this talk, I provide an overview of these foci of my research. First, I will concentrate on the individual and partner levels, specifically, the role of self-control in relationships. 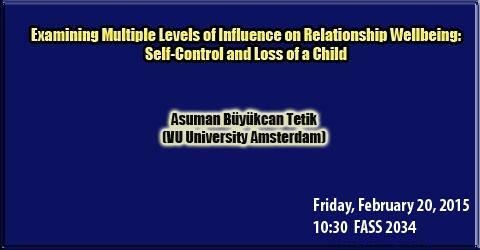 I will present findings revealing that self-control has important interpersonal consequences across different types of relationships, and show that self-control is crucial for the development and maintenance of trust. Second, I will focus on how external events affect relationships. I will present a longitudinal study among couples who have lost a child, and show how partners’ perceptions of each other’s grief process affect their relational wellbeing. My studies highlight the important roles self-control and major life events play in our close relationships. They allow me to shed light on the complex interplay of the individual, partner, and context in shaping our relationships and propose new and exciting avenues for future research.